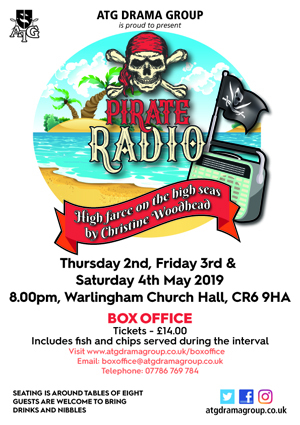 We're looking forward to high farce on the high seas this May with Pirate Radio! The cast has been announced and tickets are now on sale. Click here to buy yours now, you can choose your table and pay with a card using our online box office. Tickets cost £14 which includes your fish and chip supper during the interval. Full ATG Members are entitled to an early bird rate of £1 off per ticket until 2nd April, check your emails for your discount code. The Tandridge & Warlingham Amateur Dramatic Society are about to perform their latest play, a radio drama to be broadcast live from Warlingham Church Hall. ‘High Winds in Torguga’ is a stirring tale of romance and adventure, of pirates and lost treasure, set on the high seas in the 18th century. However, it is not all plain sailing as the group have to overcome missing cast members, dodgy electrics and unpredictable sound effects; as well as other antics that come with many an amateur production. Will our jolly crew of actors steer a straight course and finish their journey with their dignity and the good reputation of the group intact? Seating is around tables of eight, please feel free to bring your own drinks and a group of mates and make yourselves at home. Your fish and chips will be served during the interval. Tea and coffee is also available during the interval. Article posted 16th March 2019. Founded in 1968, ATG is a friendly, successful amateur theatre company based in Warlingham, Surrey. We produce an average of three plays a year, ranging from comedy, to drama, to musicals. The emphasis is placed on variety, quality and, most of all, fun! This site is designed to give a quick insight into what we have done, what we are doing, and what we plan to do in the future! ...or you can pick up the telephone and give us a call. To speak to our Members' Representative just call 07949 024 824.